Culinary Celebration in Saskatchewan | Blog | Mr. Greek – Because life has to be enjoyed! NEW LOCATIONS OPENING SOON IN REGINA! Toronto, Canada – May 6th, 2016 - Ontario-based Greek restaurant franchise signs their first deal in Saskatchewan with excited Regina entrepreneurs Angela Mamais, Yanni Mamais, Julie Dimas and Chris Dimas. The agreement will ensure the opening of Saskatchewan’s first Mr.Greek location within 6 months, and a second one following before the end of the year. Identification of the first site is presently in progress. 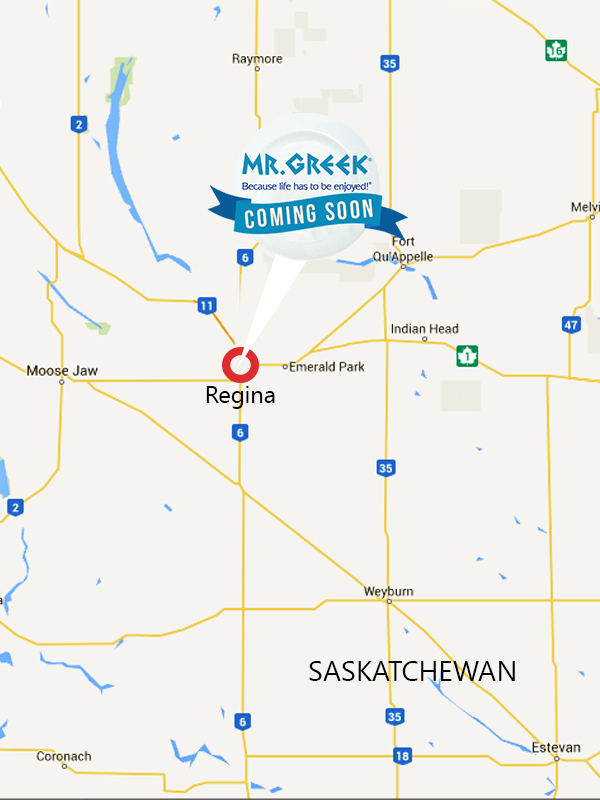 Mr.Greek’s launch in Saskatchewan is only a small part of the company’s expansion plans. The franchise is also currently developing multiple new locations across Ontario, having recently opened a new and rebranded local location in Richmond Hill, with other locations under construction Mississauga, Barrie, Pickering and downtown Toronto. The franchise has even entered the Asian market this late April announced by an elaborate Grand Opening ceremony of the first Hong Kong store. Mr.Greek Restaurants can also be found internationally in Kuwait and the UAE. “This is an exciting time for the company,” says CEO George Raios. “I am proud to introduce and provide people everywhere with a delicious, authentic and healthy Mediterranean Cuisine. But it’s not only about the food – it’s also about the experience of Greek tradition and hospitality! Mr.Greek Restaurants is a Greek Mediterranean restaurant franchise that first opened its doors in 1988 in “Greektown” on The Danforth in Toronto. Their delicious, authentic and healthy Greek fare made with only the freshest premium ingredients with no MSG, tenderizers or added preservatives has been winning awards ever since. They have full-service restaurants as well as express locations which are being rebranded into the fast-casual category. There are 17 operating locations across the GTA another 8 sensational stores are projected to open before the end of 2016.